Flemish 15th-16th century brown morocco over boards stamped with panels of the Annunciation surrounded by the inscription: Ave gracia / plena dominus tecum / o mater dei memento mei. Rev. John Cohen Jackson sale (London, Dec. 13, 1895, no. 77) to Pickering for Richard Bennett (1844-1900); Catalogue of manuscripts and early printed books from the libraries of William Morris, Richard Bennett, Bertram, fourth Earl of Ashburnham, and other sources, no. 39; purchased by J. Pierpont Morgan (1837-1913) with the Bennett Collection in 1902; J.P. Morgan (1867-1943). 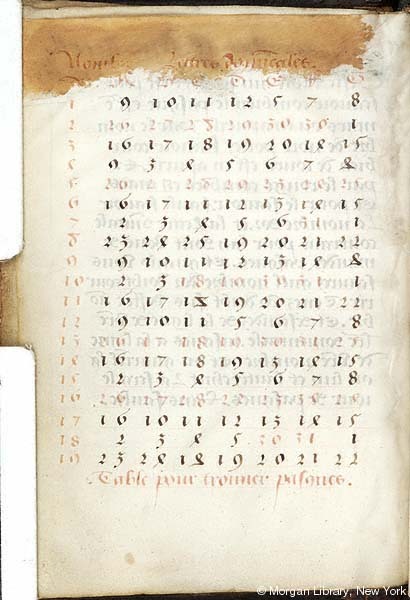 Ms. book of hours for Franciscan use; perhaps also use of Lille; calendar in French; written and illuminated in Belgium, perhaps in Tournai, ca. 1480-1490. Decoration: 9 large and 19 small miniatures. Artist: Master of Edward IV and his workshop.